Google Calendar vs Yahoo Calendar. What is the best of Productivity tools? Google Calendar is a free time-management web application offered by Google. The Ajax-driven interface enables users to view, add, and drag-and-drop events from one date to another without reloading the page. It supports view modes such as weekly, monthly, and agenda. Google Calendar allows multiple calendars to be created and shown in the same view. Each can be shared, either read-only or with full edit control, and either with specified people or with everyone (public calendars). Yahoo! 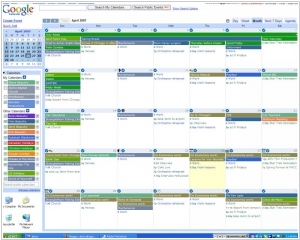 Calendar is a Web-based calendar service from Yahoo!. It can read calendar feeds and events syndicated from sites that make use of the published Yahoo! calendar programming interfaces. Google has acquired the calendar app Timeful that is intended to reduce stress, increase productivity, and bring better life balance to all the people overwhelmed by everything that competes for their time. The app worked by initially learning the daily scheduling habits of its users, before using notifications to help prioritize certain tasks. If the user stated their intention to go to the gym three times a week for instance, the app would offer suggestions and reminders for scheduling those sessions in during a user’s free time. Google plans to apply Timeful’s technology “across products like Inbox, Calendar and beyond,” Product Management Director Alex Gawley said in a blog post.